Winters' new 3A Approved Sanitary Gauge has been specifically designed to both withstand the cruel environments (harsh chemicals, high vibration, wide temperature ranges, etc.) and exceed the strict requirements of the Food, Beverage, Dairy, and Pharmaceutical Industries. This new gauge outperforms the competition, with better accuracy and an industry-leading 5-year warranty. These 3A sanitary gauges come standard with ±0.75% full scale accuracy (not 10 – 90% of the scale range, like some other gauges out there), an externally-adjustable micrometer pointer for precise pointer adjustments, and less than 0.16% per 10°F (5.56°C) temperature effect. These gauges further raise the bar with a 50% over-range capability – more than twice the industry standard – greater process and ambient temperature limits, stronger and more imnpact-resistant lenses, and more fill fuid options than most other gauges. 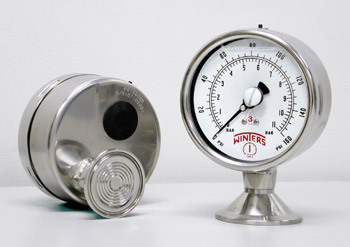 Winters' 3A sanitary gauges are solidly built, soundly engineered, and are available in 2½" and 4" dial sizes. Please contact us for more information about these gauges.